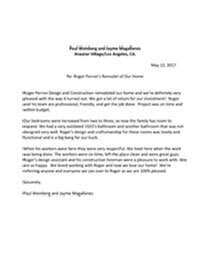 Weinberg and Magallanes » Roger Perron Inc.
Roger Perron Design and Construction remodeled our home and we’re definitely very pleased with the way it turned out. We got a lot of return for our investment! Roger and his team are professional, friendly, and get the job done. Project was on time and within budget. Our bedrooms were increased from two to three, so now the family has room to expand. We had a very outdated 1920’s bathroom and another bathroom that was not designed very well. Roger’s design and craftsmanship for these rooms was lovely and functional and is a big bang for our buck. When his workers were here they were very respectful. We lived here when the work was being done. The workers were on time, left the place clean and were great guys. Roger’s design assistant and his construction foreman were a pleasure to work with. We are so happy. We loved working with Roger and now we love our home! We’re referring anyone and everyone we can over to Roger as we are 100% pleased. Roth, Laube-Roth and Associates, Inc.